Tata Communications is pleased to confirm a new partnership with MERCEDES AMG PETRONAS which will see the delivery of world-class trackside connectivity for the team at all Formula One® race locations using the Tata Communications global network. With the new partnership, Tata Communications becomes the ‘Official Managed Connectivity Supplier’ to the team. 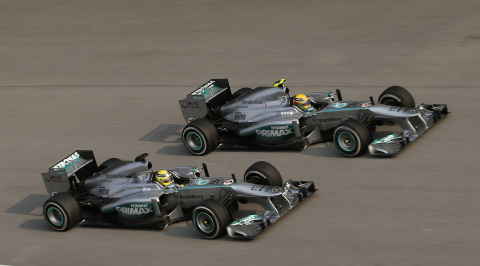 Tata Communications, a leading global provider of ‘a new world of communications,’ will work closely with MERCEDES AMG PETRONAS to deliver high-speed, high quality and secure trackside connectivity, enabling the team to transfer vital real-time data from the Silver Arrow cars at any Grand Prix location to its headquarters in the UK, three times faster than at present. The improved trackside connectivity will enable the team to react more quickly to developments at the track and help to increase car performance. © 2013 Tata Communications Ltd. All rights reserved. TATA COMMUNICATIONS and TATA are trademarks of Tata Sons Limited in certain countries.